In the days, weeks, leading up to the effective date of GDPR, we all received a plethora of revised Privacy Policies, as well as a handful of reconfirmation of email opt-ins. Surprisingly, many people in significant size U.S. organizations seem to think that these actions alone will make them GDPR compliant. Has anyone else experienced this reaction? what good we find (not just the positive reviews but the negative ones that actually engage with the work) and screen out the pointless chatter and the drive-by snarking — confident that others will be just as adept at that as we are. 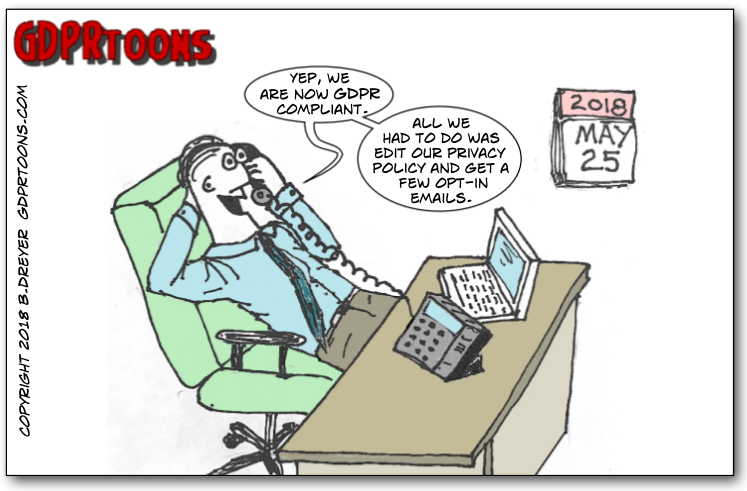 GDPRtoons.com was created by Direct Services Inc. to reinforce the complex implications of GDPR regulations, in a simple comic. Where is your potential exposure in the United States? • Do you have Prospects or Customers that reside in one of the EU 32? • Do you have Website Visitors that are entering from one of the EU 32? • Do you have Email Recipients that are opening from one of the EU 32? • Do you Process or Handle Data on individuals that are from one of the EU 32? Direct Services Inc. is a data services company which is well-informed on the GDPR Regulation, and is prepared to work closely with your Management Team, IT Team, and Data Privacy Officer (DPO) to support your compliance. If you have any comments or questions, please do not hesitate to contact our offices. Request our "GDPR Compact Guide" which we compiled from our review of the Regulation's 119 pages, 99 Articles and 173 Citations, to help facilitate our discussions with your team.